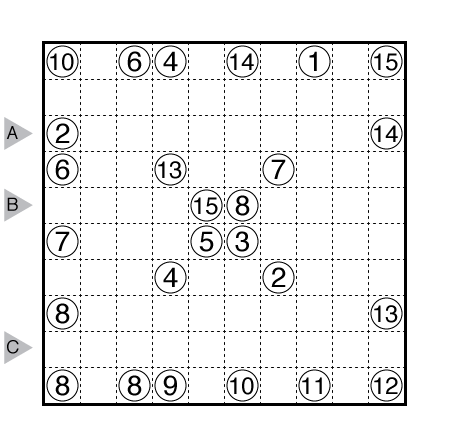 Author/Opus: This is the 121st puzzle from our contributing puzzlemaster Murat Can Tonta. Answer String: Enter the number of cells in each connected group (between bold lines) in the marked rows. 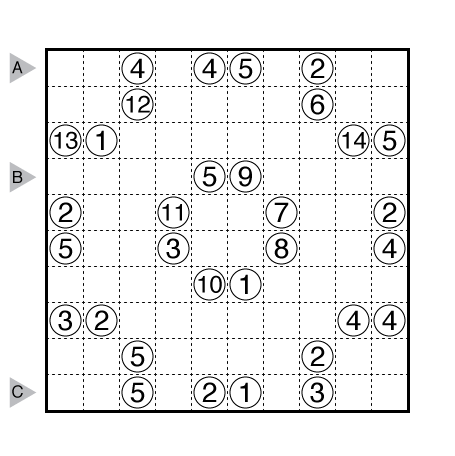 Note: Follow this link for more Araf puzzles on this website. If you are new to this puzzle type, here are our easiest Araf Puzzles to get started on. Author/Opus: This is the 98th puzzle from our contributing puzzlemaster Murat Can Tonta. 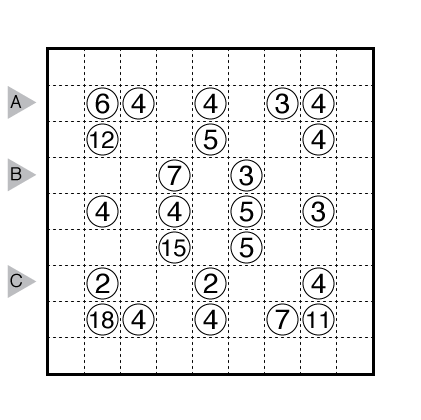 Author/Opus: This is the 1st puzzle from guest contributor Joseph Howard. Author/Opus: This is the 7th puzzle from guest contributor Hans van Stippent. Author/Opus: This is the 51st puzzle from our contributing puzzlemaster Serkan Yürekli. 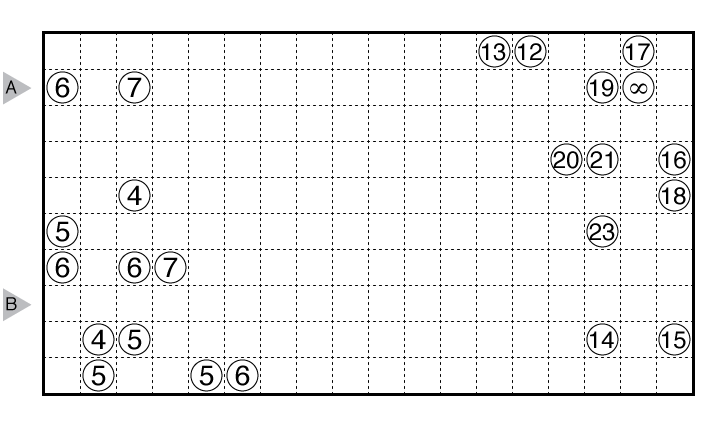 Rules: Divide the grid into some regions formed of edge-adjacent squares. Each cell is part of one region, and each region should contain exactly two given numbers. Each region must have an area that is strictly between those numbers (This means, for two number clues A and B with A < B, the area C fulfills A < C < B). Answer String: Enter the number of cells in each connected group (between bold lines) in the marked rows. If a group is a multi-digit number, enter all digits of that number. For the example above, the entry is is “34,121111,4111”. 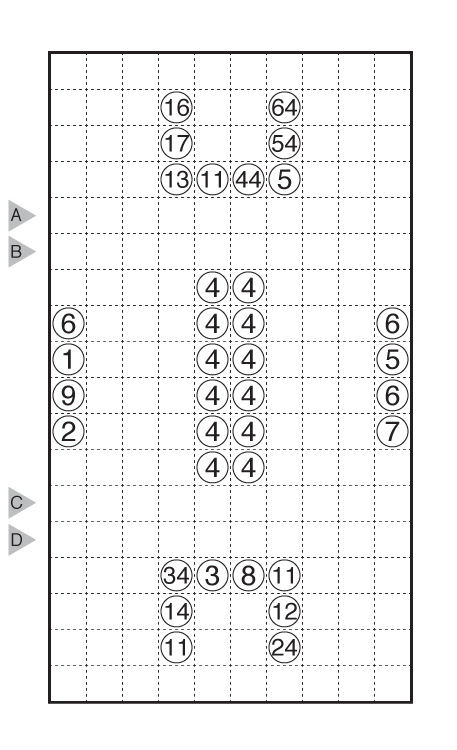 Note: Araf is a relatively new puzzle for us on GMPuzzles. Follow this link for other Araf. Author/Opus: This is the 5th puzzle from guest contributing Bram de Laat. Araf: Divide the grid into some regions formed of edge-adjacent squares. Each cell is part of one region, and each region should contain exactly two given numbers. Each region must have an area that is strictly between those numbers (This means, for two number clues A and B with A < B, the area C fulfills A < C < B). Answer String: Enter the number of cells in each connected group (between bold lines) in the marked rows. 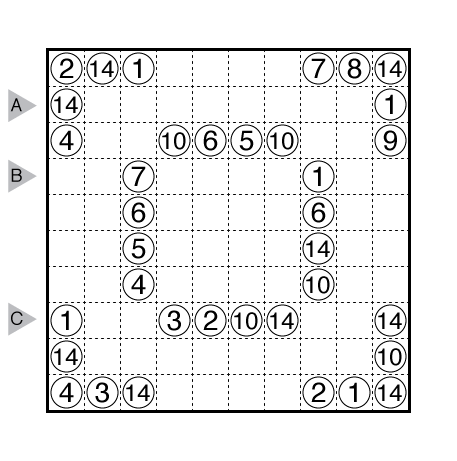 Note: Araf is a relatively new puzzle for us on GMPuzzles. Follow this link for other Araf. 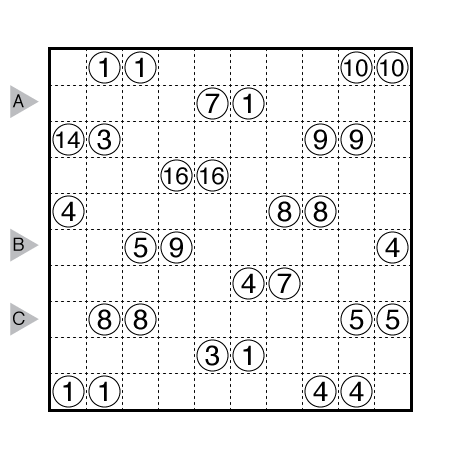 An example image for a “classic” Araf puzzle is here. Author/Opus: This is the 4th puzzle from guest contributor Bram de Laat. Answer String: Enter the number of cells in each connected group (between bold lines) in the marked rows. For the example above, this is “34,121111,4111”.